Intentional living—both for your own health and beyond—extends to the property surrounding your home. This outdoor space may include the contours of the land, natural and cultivated plantings, hardscape (walls, paths, driveway, patio, etc. ), and the products used in their maintenance. 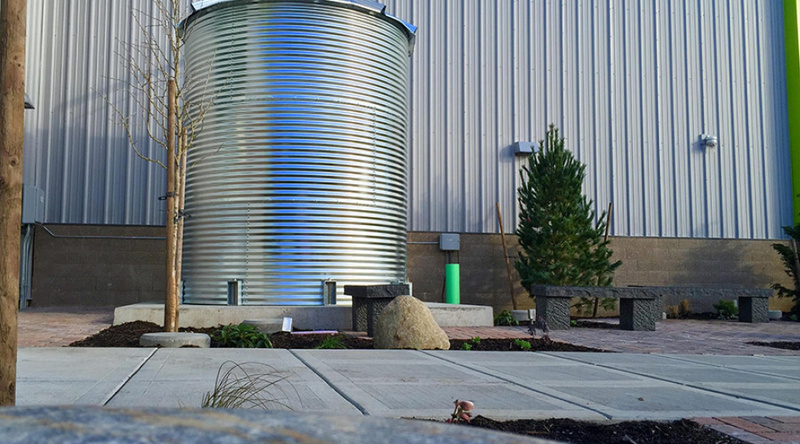 Positioned where they can intercept excess water runoff, rain gardens are bowl-shaped planting areas filled with absorbent soils and water-thirsty plants. They act like a native forest, absorbing, filtering, and slowly releasing oxygen and naturally cleaned water back into the environment. Rain gardens enhance property, provide habitat, reduce flooding, clean waterways, and provide valuable habitat in an increasingly urbanized world. Rain gardens may offer an affordable solution to landscaping dilemmas like erosion and flooding. Solid paving, whether on roads, sidewalks, driveways, or patios, channels vehicle, pet, and other pollutants into nearby water bodies. Paving that breathes, however—pavers, gravel, recycled materials, and pervious pavement—allows water, instead, to infiltrate the soil where it nourishes plants, recharges the water table, and absorbs pollutants. Yards that protect health and prevent environmental damage avoid or minimize use of materials with toxic by-products or air-polluting emissions, such as chemical fertilizers and pesticides. A healthy first-use alternative is an approach called “integrated pest management,” which takes advantage of natural plant strengths, biological controls, natural fertilizers, and beneficial insects. A healthy yard is one where children, pets, wildlife, and a naturally operating ecosystem all feel at home.